January 18, 2011 - Northrop Grumman and the Air National Guard have initiated modifications to a KC-135 air refueling aircraft in preparation for the Operational Utility Evaluation of the company's Guardian anti-missile system. The Guardian system incorporates the company's proven AN/AAQ-24(V) infrared countermeasures defensive aid system in a pod-based configuration. The AN/AAQ-24 is currently installed on over 500 fixed and rotary wing platforms for the U.S. military, foreign heads of state and allied countries. "The Guardian system is ideal for protecting legacy aircraft such as the KC-135. The pod is easily transferred from one aircraft to another in about 30 minutes, making IRCM protection a role-fit option, with fewer systems required to protect the fleet," said Carl Smith, vice president of infrared countermeasures for Northrop Grumman's Land and Self Protection Systems Division. "The first phase of the evaluation is to determine the suitability of the pod while on the aircraft with respect to its mission." 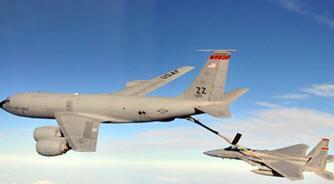 There are currently more than 400 KC-135 aircraft in service as airborne refueling platforms. Modifications to the aircraft to accommodate the Guardian system commenced on Nov. 11, 2010 at Forbes Field in Topeka, Kan. Comprehensive ground testing began on Jan. 12, 2011 with follow-on flight testing to begin on Jan. 19, 2011. The Operational Utility Evaluation is scheduled for completion in mid-March of 2011. An advanced laser-based missile protection system, Guardian is designed to protect aircraft, crew and passengers from the advanced man-portable air defense systems (MANPADS). Guardian consists of a multi-band laser pointer/tracker and an ultraviolet missile warning sensor. The system is contained almost entirely in a single pod that mounts to the underside of the fuselage. Guardian? operates by detecting launched missiles and then directing a non-visible, eye-safe laser to the seeker head of the incoming missile, disrupting its guidance signals.